Karen Jacobsen, aka The GPS Girl®, is a one-woman phenomenon. Originally from Mackay, Queensland, Karen has soared to the top of the voice over industry and is now a super-successful international speaker and performer.Not only is her voice in over 100 million GPS devices and smartphones worldwide, she’s an award winning singer- songwriter and the author of The GPS Girl’s Road Map for Your Future.A TEDx Speaker, she has appeared in The New York Times, NY Daily News, Glamour magazine and was named one of People Magazine’s Most Intriguing People in 2010. I met Karen at the Brisbane launch for Inspiration Nation, Australia’s most uplifting gift and homewares store. 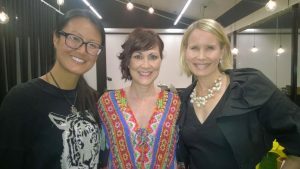 My numerology apprentice Jenny Ashton (a fellow Master 11 lifepath) read for Rozina Daniels (the owner) and connected her with Karen. That’s me, Rozina and Karen in the photo. Rozina is a savvy and inventive 34/7 Lifepath (The Spiritual Teacher). Funnily enough, Karen knows my ex-singing teacher Tamara Hansson, who also lives in New York. Even spookier, just before I met Karen, I had been dreaming of visiting the Big Apple, and bought a bag with the Statue of Liberty on it. I kept thinking ‘I should call Tamara and see if she has a room I can rent’. A few weeks later, I ran into her at Sydney Airport. She was returning for the first time in years and I happened to be en route to Brisbane. Wow. I showed her my bag and we had a chuckle. Back to Karen – she’s also no stranger to Divine coincidences. In 2002, she was hired for a one off voice-over job, which turned out to be the biggest break of her career. From this booking she created her empowerment brand “The GPS Girl”, which puts people in the driver’s seat of their businesses and lives. Karen’s date of birth (kept private) gives her a 31/4 Lifepath in numerology, which I call The Empire Builder, or Ms Practical. Many well-known artists and entrepreneurs (such as Ian White, Founder of The Australian Bush Flower Essences – see his reading) are 31/4’s. Find Your Lifepath. They’ve incarnated to heal their 4th, or Heart Chakras, and to experience true love. When this chakra is balanced, we feel connected to Earth, safe in our bodies and bring calm to chaotic situations. When this chakra is unbalanced, we over or under-give to others, and tend to skip steps. I was touched to hear Karen cite Oprah Winfrey as a role model, as Oprah is also a 31/4 Lifepath (or Master 22 in some systems). We are always drawn to people with the same purpose! There are many types of 4 lifepaths (e.g. 13/4, 22/4, 31/4, 40/4). In Karen’s case, as a 31/4, I’d expect her to mature at 31 years old, her lifepath peak year. This was the year Karen moved to New York, her dream city. Perfect timing! The 3 in Karen’s lifepath gives her a strong 3rd, or Solar Plexus Chakra of personal power. Our solar plexus contains our physical and spiritual ‘guts’, including our liver and digestive system. When this chakra is in balance, we are focused, disciplined, speak our mind (see how the 3 looks like lips from the side?) and easily manifest our ideas. When this chakra is disturbed, we have issues digesting food and life and asking for change. We may appear too passive or aggressive and attract power struggles. Read my tips for overcoming criticism. The 1 in Karen’s lifepath gives her a developed 1st, or Root Chakra of action and independence. Our root chakra includes the base of our spine, kidneys and legs, and reflects our ability to stand up for our beliefs. When this chakra is healthy, we finish what we start, act as pioneers and enjoy being ‘one of a kind’. I see 1 as a tree shooting into the sky. When this chakra is wobbly, we feel insecure, tired, and live in fight-or-flight mode. Lower back problems are common, as are cold feet, reflecting a resistance to supporting ourselves and moving forwards in life. Kundalini Yoga is great for boosting Root Chakra health – read more. Past Life Regressions also help, by reuniting us with our Soul history and family heritage – read more. Karen’s numerology reveals her natural executive ability. If she came in as a client, I would have said ‘you will be a CEO or work with CEO’s’. Not only does her DOB contain the numbers for logic and strategy, her professional name Karen Elisabeth Jacobsen adds to an 82/10/1 Destiny. See the system I use for name analysis. Your name shows how you ‘make a name’ for yourself, and in Karen’s case, she will thrive by working for herself, or with other leaders. 1 energy is all about creating new pathways. The vowels in Karen’s name add to a Master 38/11 Soul Urge – given my 11 energy, no wonder I liked her immediately! Our Soul Urge reveals our emotional and spiritual nature. Words like PSYCHIC, ENERGY and HEALING add to 38/11 and Karen has an ethereal charm and intuition that’s obvious in her music and writing. Read more on Master 38/11 Energy. The consonants in Karen’s name add to a Master 44/8 Inner Dream or Personality. Our Inner Dream reflects the first impression we make on others, and a hidden goal we’d like to achieve. Words like FOREVER, ETERNITY, COMMITMENT and MEDICINE add to 44/8. Karen is a natural legacy maker. Her life story reminds us that anything is possible when you believe in your (Higher) self and follow your calling. I’ve found that, the more Master Numbers someone carries, the more challenging their early life. This forces them to develop inner strength and faith, which helps them to shine later on. They attract fame or notoriety more easily than others, and tend to become involved in charity work. Karen supports causes including Children International, Dress for Success and Careflight. 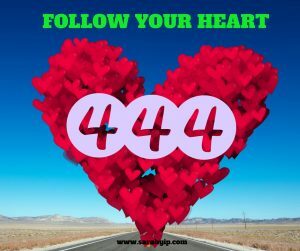 It’s common to be drawn to your lifepath number – Karen often sees 44 and 444, which is no surprise given her numerology. 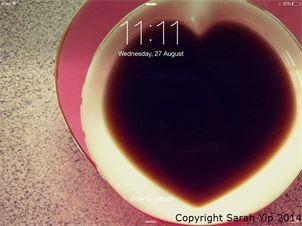 Read more on 11:11 and repeating number sightings. Many Hollywood stars have Master Number 11, 22, 33 or 44 energy in their lifepaths and/ or names (like Karen). Maybe that’s why I always wanted to be a gossip columnist – I find people with all-or-nothing personalities fascinating. Did you know? Karen was inspired to become a singer by watching Olivia Newton-John (a 39/12/3 Lifepath). Not only does New York have a 39/12/3 vibration in numerology, Karen’s son is also a 12/3 Lifepath. What a pattern. In this Universe there are no mistakes. Read more on how children choose their families – my favourite book on this topic is Spirit Babies by Walter Makichen. It’s essential reading if you want to fall pregnant and/ or understand infertility from a past life/ energy perspective. I love numerology, because it’s so accurate. In my psychic readings I can often pinpoint when people have changed jobs, relationships and lifestyles. Interestingly, Karen was hired for her breakthrough GPS voice over role in 2002, her Personal 1 Year of New Beginnings. This was also one of the biggest turning points in her numerology. Find Your Personal Year. Karen is in a Personal Master 33/6 Year. Based on her chart, 2015 was about setting up her later life. Many of the people she met in this period will remain in her life as teachers and students. A Personal 6 Year often brings changes in our home lives. We may move house or renovate, spend more time with loved ones and/ or decide to improve our work/ life balance. We’re healing our 6th, or Third Eye Chakra, i.e. our spiritual vision. This is a time to nourish ourselves rather than overwork. More on the Third Eye Chakra. Master 33/6 energy increases the likelihood Karen will meet high-fliers in 2016, especially thought leaders and cause-promoters. These encounters will open her mind, and psychic or healing abilities. Her biggest months will be March -April 2016, as she moves through a phase of endings and beginnings into a phase of emotional healing in May. Karen’s hands reveal Air and Fire energy. Her wiry lines, squared palms and long fingers suggest a busy, inquiring mind, practical approach (matching her 31/4 Lifepath) and ability to master details (air qualities). The depth of her lines, pink/ red colour and structure of her hands reflect her passion for life, need for variety and business acumen (fire qualities). Her sturdy-looking thumbs are on the shorter side. This pattern gives her a collaborative approach, which is helpful for working in the music industry. It means she can share control. Slightly curved forefingers means she takes most advice with a grain of salt. Her little fingers (Mercury fingers) slant away from her other fingers. Coupled with her long, deep Heart lines, these suggest a romantic but private person. It takes time for them to completely trust people, and they need regular alone time to recharge. Karen’s straight, well-developed Head Lines imply a clear thinker – someone who says what she means. She’s also a lifelong learner, who can defend her views when needed. Karen’s Fate Line on her left (active/ writing) hand rises from her Luna Mount (the mount of imagination), rather than the middle of her palm. This suggests that her calling involves the public. Friends and strangers may help her more than people from her birthplace. 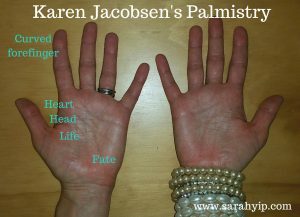 Read more about palmistry and what it can tell you. People with Master Number numerology often have unusual palmistry. Karen is in this category – many of her lines (including her Life Line) are doubled or forked, suggesting a sensitive, ambitious Soul wanting to pack a lot of evolution into one lifetime! This book and journal is filled with lists to write and inspiration for creating the destination of your dreams. Designed to give you increased daily focus, confidence in decision making and a road map for your future, The GPS Girl points us all in the right directions with her first book. THANK YOU Karen for the opportunity to read for you. I wish you all the best on your mission to help people find their way home and to recalculate their journeys. Find Karen at thegpsgirl.com and on facebook as The GPS Girl. Her TEDx talk is well worth watching (and very funny). If you like this blog, please join my facebook page The Numbers Queen. You can browse my library of psychic readings for other celebrities and famous people to learn more about what I do. You can also subscribe to my e-news for articles (see homepage). Or email. Comments below will be published once approved. Why Am I Seeing Repeating Numbers such as 1111, 111, 222 and 333?